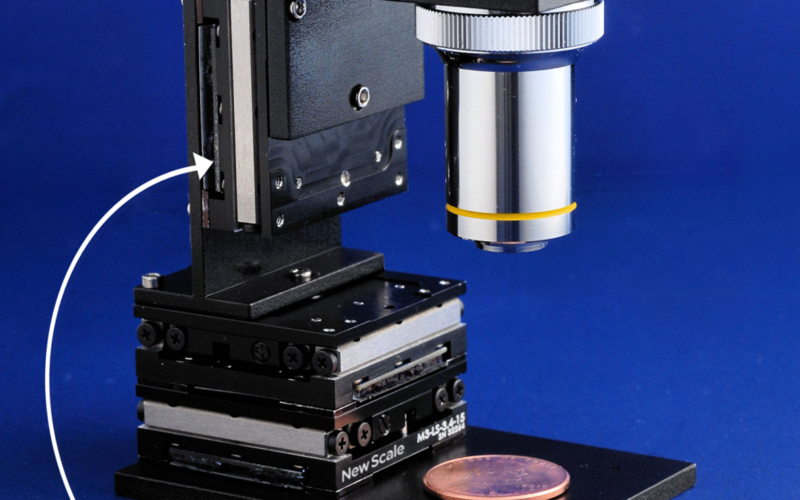 Victor, NY – Sept. 25, 2018 – New Scale Technologies, Inc. has introduced a compact linear positioning stage targeting embedded microscopes in automated instruments for in-vitro diagnostics, next-generation sequencing, digital cell morphology and pathology, 3D imaging, cell sorting and counting, microelectronics inspection, and other applications where small size and high precision are essential. The M3-LS-3.4 Linear Smart Stage has all control electronics embedded inside the stage. No external controller is needed, resulting in the smallest system size for instrument designers. The controller accepts high-level motion commands via direct digital interface, for fastest system integration and time to market. The complete stage including controller is only 32 x 32 x 11 mm. The reduced-voltage piezoelectric microstage operates on 6 VDC and requires no high-voltage isolation. For specifications, videos, drawings and purchasing information visit https://www.newscaletech.com/applications/microscopy/. M3-LS-3.4 Linear Smart Stage developer’s kits are available now from New Scale Technologies. New Scale’s M3 Smart Modules incorporate patented piezoelectric Squiggle® micro motors, position sensors, drive electronics, firmware and patented control technologies in miniature housings with precision bearings, slides and other mechanisms. The internal controller operates on 3.3 VDC or 6 VDC and connects directly with a system processor. They enable designers to embed precision motion in handheld, portable and battery-powered instruments with fastest time to market and lowest total cost. SQUIGGLE® is a registered trademark of New Scale Technologies, Inc.